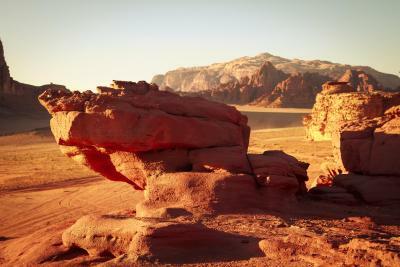 Lock in a great price for Desert Rose Camp – rated 8.4 by recent guests! It's a real privilege f to spend the night on such an extraordinary place with such marvellous hosts. I was the only person stressing on this night but that was in no way a problem. Such heartfelt hospitality! 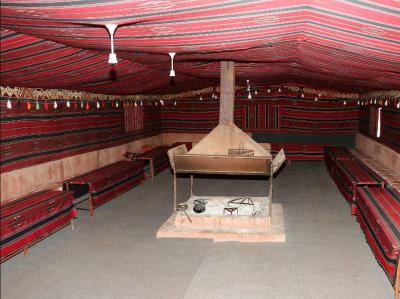 It is a wonderful location, very helpfull and hospitalier staff, the conditions are above a "desert" camp. The desert camp experience was neat but not what we had envisioned. 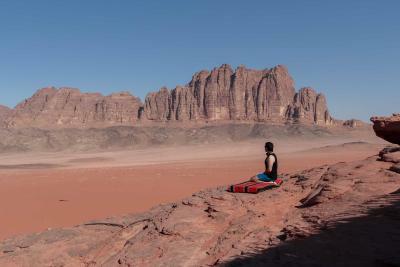 Amazing experience at Wadi Rum. We loved “glamping” at Desert Rose! The food was especially amazing and the scenery was fantastic. 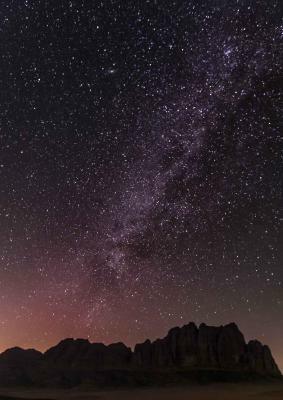 Everything was beautiful, amazing view, pink red colors of the dunes, the tent was very comfortable,with private bathroom very clean, ffeel to be st home! 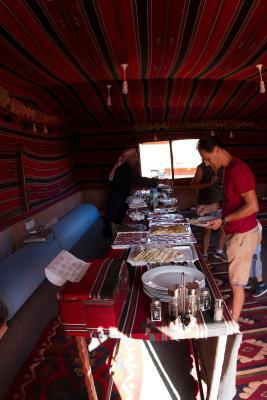 Kind and fantastic staff which help us in everything, they organize us a 4 hours trip in the desert that was a dream! The view from the camp is really wonderful especially for the sunset. Unfortunately windy. The bathroom in the room it is a very positive option. The staff was kind and willing to accommodate our requests as much as possible. The camp seems well organized and adequate for its purpose. We did receive two hot-water bottles (cheap made in China stuff) when I pointed out it is too cold for my kids. The camp is well-organized, tents are big. We booked tents with private bathrooms and the bathrooms were fine, with water supply better than in hotels. The staff was very kind and helpful. Great scenery from the camp. 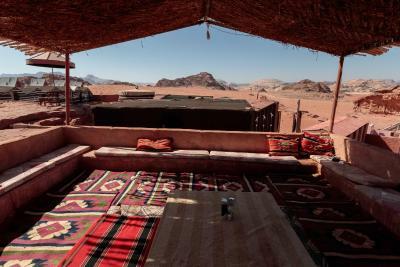 One of our top picks in Wadi Rum.Located in Wadi Rum, Desert Rose Camp has accommodations with a garden. The campground offers a buffet or halal breakfast. There's an on-site restaurant, which specializes in Local and Mediterranean cuisine and also offers vegetarian and halal options. 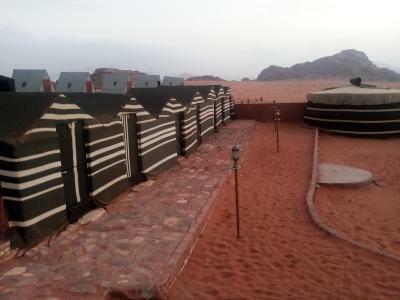 Desert Rose Camp has a terrace. If you would like to discover the area, cycling is possible nearby and a car rental service can be arranged. 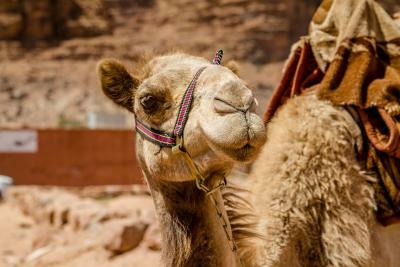 When would you like to stay at Desert Rose Camp? House Rules Desert Rose Camp takes special requests – add in the next step! All children under 12 years are charged JOD 10 per night for extra beds. Any additional older children or adults are charged JOD 15 per night for extra beds. 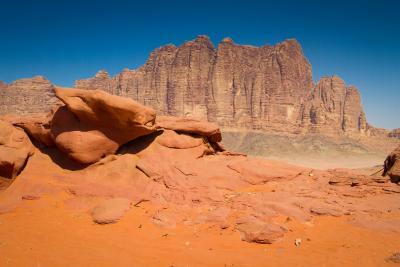 Please note that Jeep tours, mountain climbing, and camel rides can be arranged by Desert Rose Camp staff. Please inform Desert Rose Camp of your expected arrival time in advance. You can use the Special Requests box when booking, or contact the property directly using the contact details in your confirmation. The information offered prior to the visit was poor and perhaps even a bit misleading: the jeep is actually a pick-up truck, if you do only 2 hours of the 4 hours "jeep" tour you are still asked to pay for an activity you will not do, etc... I would not recommend the camp to families with kids under 12 when the weather is cold outside. Even if they have electricity the camp doesn't offer any kind of heating. The transportation back to the Village was in an open pick-up truck (another gentlemen was sat inside while me with my two boys 7 and 9 had to ride in the back - we all got a cold afterwards). Sheets for the blankets would have made the stay more comfortable. What I did not like was to LEAVE the camp after only 3 days! I loved staying at this camp! MY ROOM: 2 beds with thick blankets, some shelves, a small table and a surprisingly big, tiled bathroom with modern toilet, including toilet paper, wash basin and shower with hot water. Electric light in room and bathroom. SOCIAL LIFE: I travelled alone. But never felt alone. Met with fellow travellers in the restaurant building. Spent the evening sitting om mattresses around the open fire. Having interesting conversation with people from all over the world, and our hosts joining in, tending the fire end serving bedouin tea. MEALS: I did not miss anything. Had my breakfast & coffee outside, facing the morning sun over the mountains in the east. Dinner was absolutely first class. Every day something new. Lovely soups, a great choice of salads. and very tasteful main dishes and even desserts. The "mansaf" last day was the highlight, with rice, meat, toasted peanuts and a heavenly yoghurt sauce. 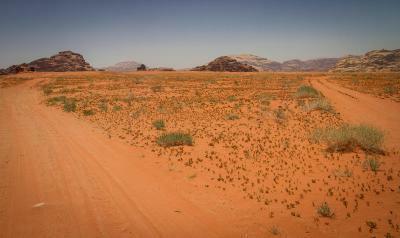 THE SCENERY: Desert Rose Camp is REALLY in the middle of the desert. 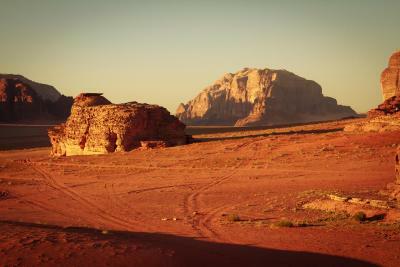 Camels were grazing around us, and the view of the wide plains and far away mountains brings peace to the mind. Besides, being february and after some rain, the desert was blooming! Sunset over the desert was amazing, and the full moon nothing less. THE ENERGY: I was happy to see the camp was totally powered by solar panels. 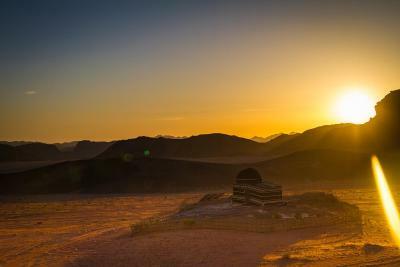 They avoid use of a fuel driven generator, both for the free solar energy, but also so the visitors can enjoy the quietness of the desert. 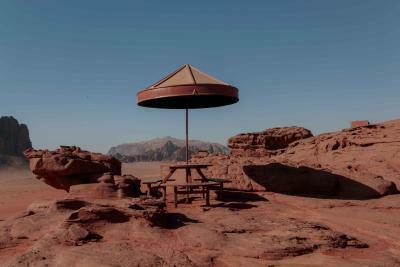 THE TOUR: I booked a 6 hour trip with car to see more of the desert, and had a most enjoyable time with Abdulrahman as my driver. He gave me short explaination of the main points, and allowed me to wander around on my own as long as I liked. Truely a great day! THE STAFF: Without the attentive and helpful staff, the camp just would not work. Every question and request was immediately responded to. Especially Muhamed became my anchor in the desert, I think he knows how or who to fix just anything. 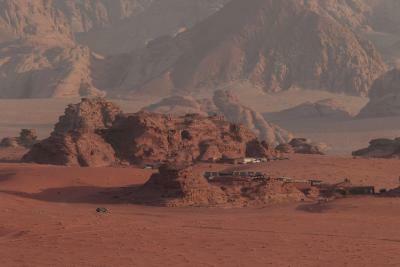 Make no mistake that this is camping in a real desert. Having said that, what could be better. Fantastic location and friendly owner. The dinner in the evening tasted excelent and very rich, although only 7 ppl. in total staid in the camp that night. You can also get wine for dinner (extra payment). Sam the manager was kind and very obliging. Normally during the peak season there would have a full time chef. As we were the only guest for that one night Sam did an excellent dinner and breakfast - very tasty. The sunset was amazing we had a great view from the camp. Don't expect a lot with the accommodation it's camping not glamping. We had a comfortable stay - for our one night and Sam was very welcoming. There was no communication about the parking procedure and we had to park in a lot and get into a truck with our baggage to drive to the camp. We were asked repeatedly to go on an excursion right away but we wanted to settle in and felt pressured to go on the tour. There was no REAL coffee at the site or drinks available when we arrived. We understand that it is rustic but it was not worth the money we spent. I would not recommend this place to any friends. Food. Overall not at all good value for money! Be sure to ask for what you need. The staff is wonderfully helpful.